This past weekend I had the pleasure of going to Austin, Texas with Hyundai USA to test drive the 2019 Veloster. 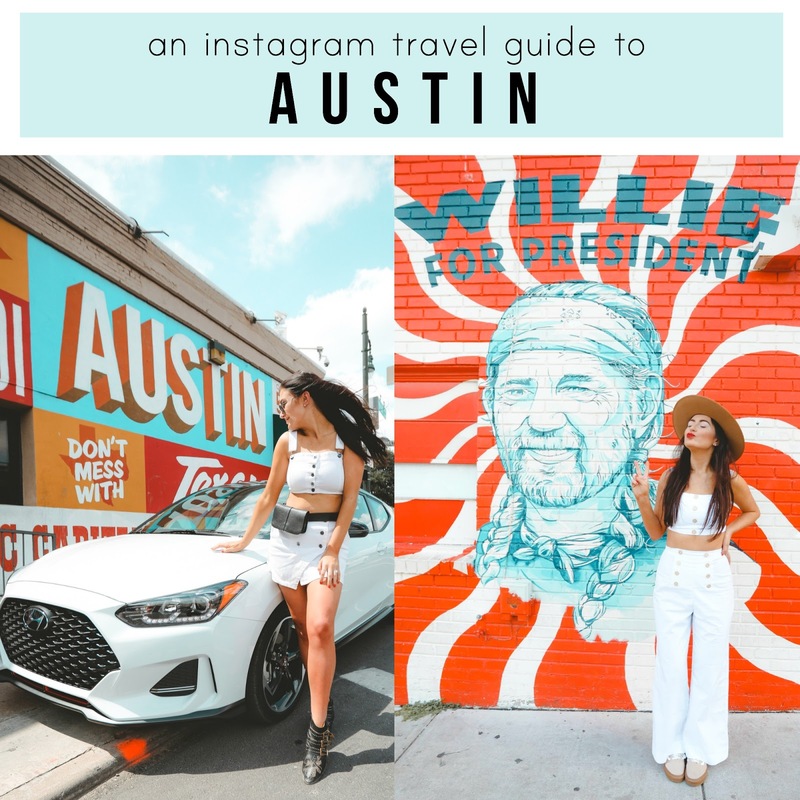 When I mentioned traveling to Austin, Texas, you all requested that I do a travel guide on my blog because Austin is such a popular travel destination these days. While my weekend was spent on a business trip, I did get to see some amazing sights and do some amazing things all thanks to the amazing Hyundai brand! So here is what I did, what I saw, what I wore and what I ate while in Austin. When we touched down in Austin, our driver took us to our hotel which was the Kimpton Hotel Van Zandt near Rainey Street. I loved our hotel! I've stayed in 3 Kimpton hotels this year, one in Nashville, one in Palm Springs and now Austin. They are becoming my favorite hotels because each hotel has such an unique aesthetic. I also loved the proximity of the hotel to all the bars on Rainey because you don't even have to uber to the bars at night, it's just a quick walk away. For lunch on Friday we went straight to In-N-Out right on UT's campus a few miles from our hotel. Cody and I love In-N-Out, it's actually an addiction along with Shake Shack, we know how basic that is. Then we explored Rainey Street, unfortunately a lot of the places didn't open until 4pm but we did find ourselves walking into the Container Bar for a drink or two. The Container Bar was actually super cool made out of shipping containers and from the sound of it, it turns up hard at night! After exploring we headed back to the hotel where we had a cocktail hour with Hyundai on the pool deck before heading to dinner at the hotels restaurant, Geraldine's. It was so good! I'm not usually a "foodie" like most bloggers but I was very impressed with the food at the restaurant. My favorite was the Barbecued Short Rib and the desserts were to die for! We hit up the bar, Unbarlievable after dinner and it was so fun! I love the outdoor games that many of the bars on Rainey have but this bar was even better because they had a slide on the inside. Drunk Sarah loves that. It was a great place for a night out! Saturday morning and afternoon was spent exploring Austin and the surrounding area in the Veloster! It was fun really getting to see more than just downtown by the hotel, we got to go sit by the lake and enjoy lunch by the river at County Line BBQ. Honestly wasn't impressed with the BBQ, I think it's because I'm so use to Southern BBQ like pulled pork and lots of BBQ sauces. We drove around to find the perfect location for the Hyundai instagram for the campaign we were in Austin for. Since it was graduation weekend, it was a little more difficult than expected but we found the perfect mural for the job. For dinner we went to Emmer & Rye on Rainey and let's just say, it's not my kind of place. As I said earlier, I am not a foodie and will never claim to be. If the food looks too pretty to eat, I probably won't like it. A lot of other people enjoyed it but Cody and I just enjoyed our time with our friends and the rest of the Hyundai team at the restaurant. Sunday was our last day in Austin and we flew out in the afternoon so we woke up early to explore the rest of Austin that we hadn't seen yet! We started the day off at South Congress to see the famous Austin Motel and all the fun shops & murals along the strip. There are so many fun murals in South Congress, it reminded me so much of Nashville! The one thing I wish Nashville had that South Congress has is that store with the sparkled cow skulls. Unfortunately I couldn't spend $350 on one and safely bring it home on the plane. I wish I could! I did pick up a turquoise vintage ring from one of the stores on the drag, couldn't resist a little souvenir. After exploring South Congress we went to Blue Owl Brewing so Cody could sample some of the sours the brewery is known for! I didn't drink any, instead I changed into the For Love & Lemons dress to prepare for the next pictures I wanted to take. Typical. 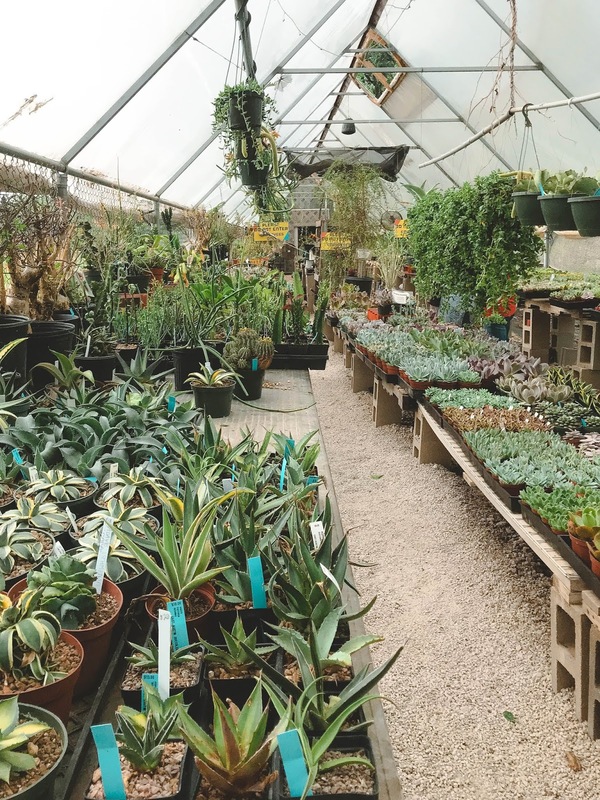 We went to the East Austin Succulents which honestly might have been my favorite thing about Austin. This nursery literally had so many funky plants, succulents and cacti that I've never seen before. I wanted to take everything home with me! Unfortunately it started to downpour and every restaurant we wanted to go to for lunch was forever long wait so we just went to Shake Shack before heading to the airport! You can shop the outfits here or check under each outfit for every link! A vlog will be coming soon so get excited for that on my channel! Have you ever been to Austin? There are so many other parts of Texas that I want to explore someday but I'm excited to have had the opportunity to go with Hyundai even for just a weekend. Thanks so much! Shake Shack & In N Out are the least Austin things about Austin. Also, I wouldn’t go around plugging Unbarlievable, as they were recently embroiled in a racism snafu (https://patch.com/texas/eastaustin/east-austin-bar-accused-fostering-racism-part-its-theme). Also, also, Rainey is the worst street in town to hang out on. I know, I didn't claim for them to be "Austin" this is my weekend in Austin so I was telling people what I did. How was I supposed to know about the Unbarlievable when I don't live there or research EVERY bar I step into? Geez chill out.